Why are so many of our “surgical” strikes going so terribly wrong? It goes without saying that such a headline could only be applied to assumedly dangerous foreigners—“terror” or “Al Qaeda suspects”—in distant lands whose deaths carry a certain quotient of weirdness and even amusement with them. Try to imagine the equivalent for the Newtown massacre the day after Adam Lanza broke into Sandy Hook Elementary School and began killing children and teachers. Since even the New York Post wouldn’t do such a thing, let’s posit that the Yemen Post did, that playing off the phrase “head of the class,” their headline was: “Dead of the Class!” (with that same giant exclamation point). It would be sacrilege. The media would descend. The tastelessness of Arabs would be denounced all the way up to the White House. You’d hear about the callousness of foreigners for days. And were a wedding party to be obliterated on a highway anywhere in America on the way to, say, a rehearsal dinner, whatever the cause, it would be a 24/7 tragedy. Our lives would be filled with news of it. Count on that. But a bunch of Arabs in a country few in the United States had ever heard of before we started sending in the drones? No such luck, so if you’re a Murdoch tabloid, it’s open season, no consequences guaranteed. As it happens, “Bride and Boom!” isn’t even an original. It turns out to be a stock Post headline. Google it and you’ll find that, since 9/11, the paper has used it at least twice before last week, and never for the good guys: once in 2005, for “the first bomb-making husband and wife,” two Palestinian newlyweds arrested by the Israelis; and once in2007, for a story about a “bride,” decked out in a “princess-style wedding gown,” with her “groom.” Their car was stopped at a checkpoint in Iraq by our Iraqis, and both of them turned out to be male “terrorists” in a “nutty nuptial party.” Ba-boom! After all, by the count of TomDispatch, this is at least the eighth wedding party reported wiped out, totally or in part, since the Afghan War began, and it extends the extermination of wedding celebrants from the air to a third country—six destroyed in Afghanistan, one in Iraq, and now the first in Yemen. And in all those years, reporters covering these “incidents” never seem to notice that similar events had occurred previously. Sometimes whole wedding parties were slaughtered, sometimes just the bride or groom’s parties were hit. Estimated total dead from the eight incidents: almost 300 Afghans, Iraqis and Yemenis. And keep in mind that, in these years, weddings haven’t been the only rites hit. US air power has struck gatherings ranging from funerals to a baby-naming ceremony. The only thing that made the Yemeni incident unique was the drone. The previous strikes were reportedly by piloted aircraft. Non-tabloid papers were far more polite in their headlines and accounts, though they did reflect utter confusion about what had happened in a distant part of distant Yemen. The wedding caravan of vehicles was going to a wedding—or coming back. Fifteen were definitively dead. Or eleven. Or thirteen. Or fourteen. Or seventeen. The attacking plane had aimed for Al Qaeda targets and hit the wedding party “by mistake.” Or Al Qaeda “suspects” had been among the wedding party, though all reports agree that innocent wedding goers died. 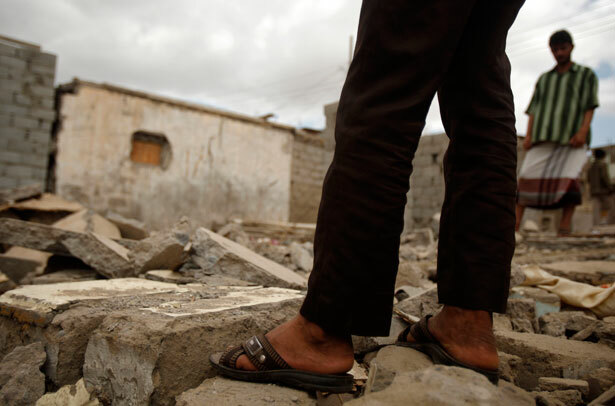 Accounts of what happened from Yemeni officials differed, even as that country’s parliamentarians demanded an end to the US drone campaign in their country. The Obama administration refused to comment. It was generally reported that this strike, like others before it, hadstrangely enoughupset Yemenis and made them more amenable to the propaganda of Al Qaeda on the Arabian Peninsula. In the end, reports on a wedding slaughter in a distant land are generally relegated to the inside pages of the paper and passing noticeon the TV news, an event instantly trumped by almost anything whatsoever—a shooting in a school anywhere in the US, snow storms across the Northeast, you name it—and promptly buried and forgotten. And yet, in a country that tends to value records, this represents record-making material. After all, what are the odds of knocking off all or parts of eight wedding parties in the space of a little more than a decade (assuming, of course, that the destruction of other wedding parties or the killing of other wedding goers in America’s distant war zones hasn’t gone unreported). If the Taliban or the Iranians or the North Koreans had piled up such figures—and indeed the Taliban has done wedding damage via roadside bombs and suicide bombers—we would know just what to think of them. We would classify them as barbarians, savages, evildoers. You might imagine that such a traffic jam of death and destruction would at least merit some longer-term attention, thought, analysis or discussion here. But with the rarest of exceptions, it’s nowhere to be found, right, left, or center, in Washington or Topeka, in everyday conversation or think-tank speak. And keep in mind that we’re talking about a country where the slaughter of innocents—in elementary schools, high schools, colleges, and universities, workplaces and movie theaters, parking lots and naval shipyards—is given endless attention, carefully toted up, discussed and debated until “closure” is reached. And yet no one here even thinks to ask how so many wedding parties in foreign lands could be so repeatedly taken out. Is the US simply targeting weddings purposely? Not likely. Could it reflect the fact that, despite all the discussion of the “surgical precision” of American air power, pilots have remarkably little idea what’s really going on below them or who exactly, in lands where American intelligence must be half-blind, they are aiming at? That, at least, seems likely. Or if “they” gather in certain regions, does American intelligence just assume that the crowd must be “enemy” in nature? (As an American general said about a wedding party attacked in western Iraq, “How many people go to the middle of the desert… to hold a wedding 80 miles from the nearest civilization?”) Or is it possible that, in our global war zones, a hint that enemy “suspects” might be among a party of celebrants means that the party itself is fair game, that it’s open season no matter who might be in the crowd? In this same spirit, the US drone campaigns are said to launch what in drone-speak are called “signature strikes“—that is, strikes not against identified individuals, but against “a pre-identified ‘signature’ of behavior that the U.S. links to militant activity.” In other words, the United States launches drone strikes against groups or individuals whose behavior simply fits a “suspect” category: young men of military age carrying weapons, for instance (in areas where carrying a weapon may be the norm no matter who you are). In a more general sense, however, the obliterated wedding party may be the true signature strike of the post 9/11 era of American war-making, the strike that should, but never will, remind Americans that the war on terror was and remains, for others in distant lands, a war of terror, a fearsome creation to which we are conveniently blind. Consider it a record. For the period since September 11, 2001, we’re number one… in obliterating wedding parties! In those years, whether we care to know it or not, “till death do us part” has gained a far grimmer meaning.